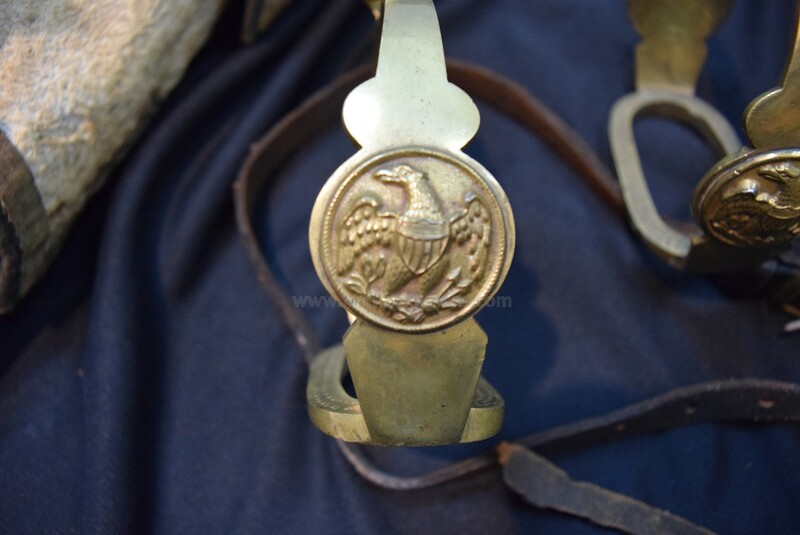 This is simply one of the rarest groupings we have ever come across, and if you appreciate United States Officers Horse Accouterments, you're going to love reading about this. 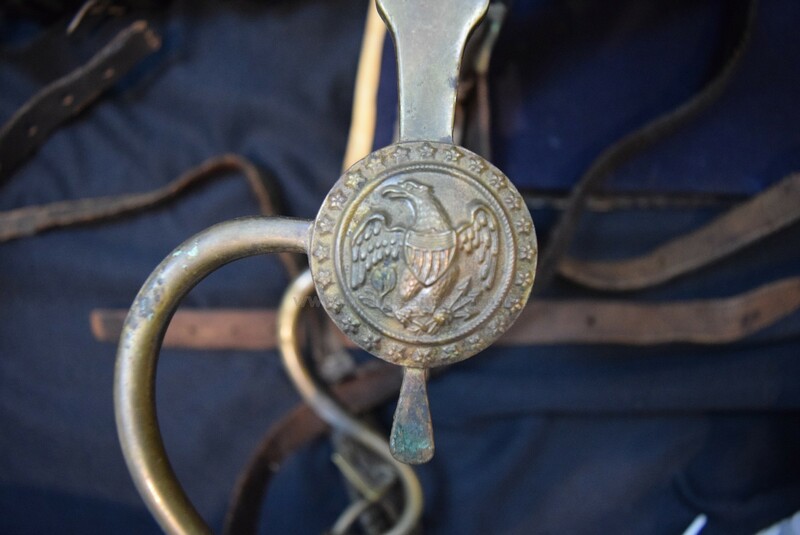 This group of material came from an old farm on Long Island and has everything that one would expect a Military Officer to be mounted with, except for an original saddle, which was discarded years earlier by the family due to its deteriorated condition (falling apart into several pieces). 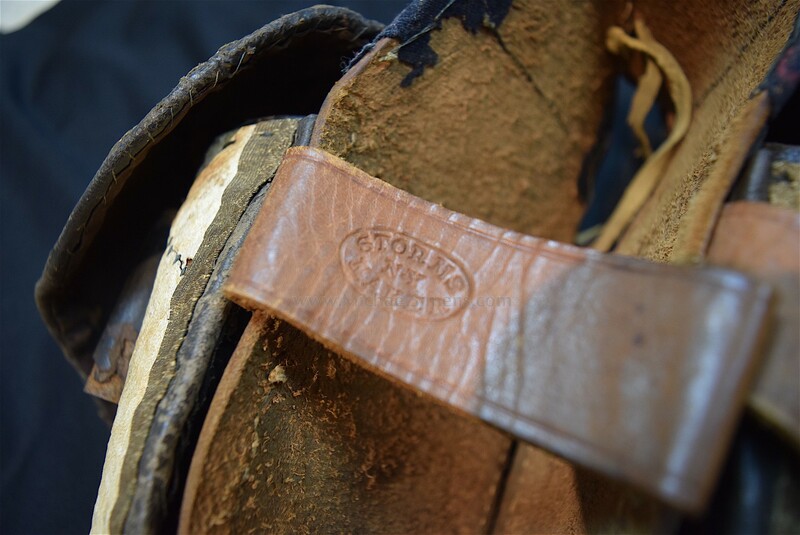 The saddle had been stored in the barn, the other items obviously well cared for in the home. 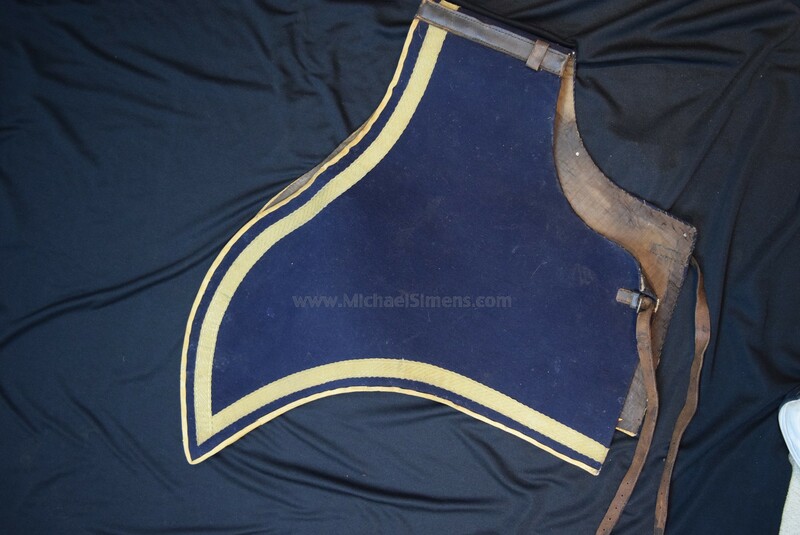 The group consists of items from the 1830's to include an original flared saddle-blanket with its original fastening straps and hardware showing 1" gold-bullion ribbon trim and a 1/2" white buff leather border, now yellowed / its original and complete bridle assembly to include an early Eagle bossed Officers Dragoon bit and decorative rosettes, the leather being trimmed in the same white buff leather as the blanket / a spectacular 1-piece Martingale of the same white buff leather with a massive brass star plate on its crest and fastening straps and hardware / an early set of decorative brass Officers Stirrups with matching bosses to the bridle / the original crupper with matching rosettes to the bridle / a fantastic pair of Officers grade pommel holsters for a pair of single-shot pistols. 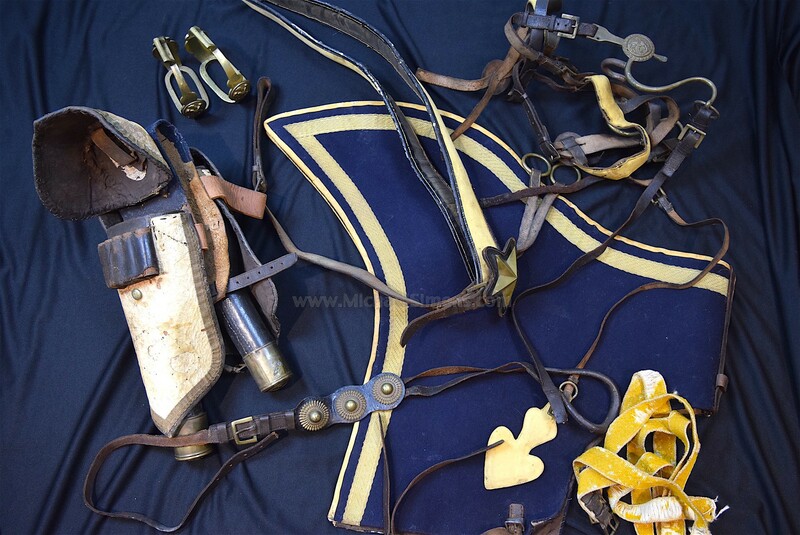 The holsters show gold embroidered trim that match the blanket, "STORMS" embossed leather fastening straps, original flaps that cover a cartridge pouch on each holster and an unbelievable original fancy label marked, "H. J. STORMS & CO. / SADDLE, CAP AND HARNESS MAKER / No. 34 FULTON ST. / NEW YORK / TRUNK & C. & C.". The items in this grouping show almost no use and cannot be improved upon. They are near mint condition. 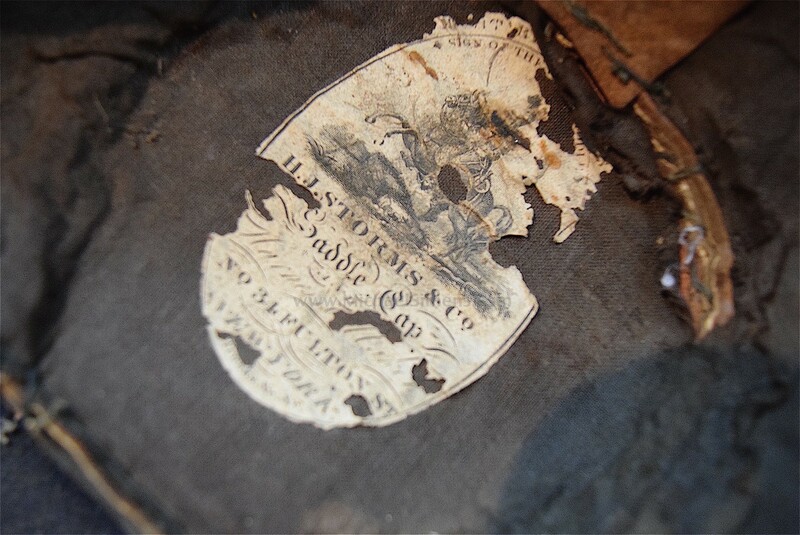 If you fancy yourself as a collector or curator of only the finest Military Horse Equipage, you'll not find a better or more complete grouping. If you have the saddle, here's the rest of your rigging.